Are hardware and software updates enough to justify buying the new model? HTC has officially lifted the veil on the new HTC One (M8). The Taiwanese manufacturer has made a bold decision by releasing the new flagship phone on the same date as its official announcement, giving the device a two week head start against the Galaxy S5. At face value, the new One looks very similar to the older model released last year. Questions such as “is it worth upgrading?” are inevitable, but finding the answer is not difficult at all. All it takes is a side-by-side comparison between the old and new model and things become crystal clear. Without further ado, join us below and we’ll discuss what makes the new One a different device from its predecessor. Last year’s HTC One hit the market featuring some of the best hardware components available at the time. Those included the Qualcomm APQ8064T Snapdragon 600 quad-core processor clocked at 1.7 GHz, an Adreno 320 graphics chip and 2 GB of RAM. The device was offered with 32 / 64 GB of on-board storage (with no possibility of expanding). The handset was powered by a 2,300 mAh Li-Po battery and it currently runs on Android 4.3 Jelly Bean, with Android 4.4 KitKat being planned for a future release. As expected, this year’s One (M8) takes advantage of some of the newest hardware pieces available today. However, unlike last year’s model, the One 2014 comes in two main flavors, one destined for the US and EMEA markets, and the other for Asia. The former variant makes use of the Qualcomm MSM8974-AB Snapdragon 801 quad-core SoC running at a frequency of 2.3 GHz, whereas the version retailed in China and the rest of Asia takes advantage of the more powerful MSM8974-AC Snapdragon 801 processor, clocked at 2.5 GHz. The handset features an Adreno 330 graphics chip, 2 GB of RAM and is being retailed with 16 or 32 GB of storage. Fortunately, unlike last year’s model, the M8 packs a microSD card slot which can expand the storage by up to an additional 128 GB. The HTC One formerly known under the codename “M7” was released on the market packing a 4.7-inch Super LCD3 display, boasting a resolution of 1080 x 1920 which results in a very high pixel density of 469 pixels per inch. The screen was protected by Corning Gorilla Glass 2. The HTC M8 hasn’t pushed the limits of screen resolution to newer grounds, so it comes with a full HD panel just like last year’s model. However, the newer One packs a slightly larger 5.0-inch Super LCD display, protected by Corning Gorilla Glass 3. Since the resolution has been retained while the diagonal has been increased, the pixel density dropped to 441 ppi, but we’re certain that you won’t be able to tell the difference. Manufacturing the original One has been quite difficult for HTC, given the choice of premium materials and its slick design. Still, the Taiwanese manufacturer managed to pull it off, and last year’s flagship phone is one of the best looking Android devices around. Fortunately, HTC improved its craft and this year’s model looks even better. The handset boasts a beautifully finished metal unibody, with a rounded back and thin edges on the sides. The dimensions are a tad different though, mainly because of the larger screen on the M8. As such, the original One measures 137.4 x 68.2 x 9.3 mm, whereas the new model’s dimensions are 146.4 x 70.6 x 9.4 mm. The M8 is slightly heavier as well, weighing 17 grams more than its predecessor, for a total of 160 grams. It’s also worth mentioning that the new HTC One has replaced the capacitive navigation keys with on-screen buttons, and that’s a change that Android purists are definitely going to enjoy. In recent years, the amount of megapixels on a smartphone’s camera have become pretty big deal for many consumers. Photography enthusiasts know that the amount of MPs doesn’t make a picture better by default, and HTC took a big risk in 2013 when it announced that the HTC One would feature a 4 MP camera dubbed “UltraPixel.” At the cost of megapixels, the camera promised better performance in low-light conditions and a handful of other sought-after goodies. This year’s model continues on the “UltraPixel” path, but there’s a twist: The M8’s main camera is very similar to last year’s model, and it features 4 MP, a 1/3” sensor, a pixel size of 2µm, and video recording capabilities of [email protected] / [email protected] The new model, however, packs a dual-LED flash instead of a single LED flash, and it also boasts a 5 MP front-facing camera instead of a 2.1 MP unit. More importantly however, is the fact that the new model packs two main cameras instead of one. In a nutshell, there are two cameras on the back of the One M8, one of which is the 4 MP UltraPixel unit. The second one has the task of gathering depth information (similar to how 3D works). As such, this unique camera combo, combined with the camera app, offers a wide range of interesting post-processing options, such as “UFocus.” This gives a bokeh effect, similar to what you’d obtain from a DSLR when setting a low aperture and isolating the main subject. Much like last year’s model, the new HTC One features BoomSound stereo speakers, but this time around there’s no Beats tech to be found. Even the Beats logo in the notification bar has been replaced, and the whole system takes advantage of new algorithms. The BoomSound speakers themselves have been improved since last year, and according to HTC, they’re also 25 percent louder, mainly due to the addition of a new amplifier and the extra space behind the speakers themselves. On the software side of things, the M8 introduces an interesting list of features, such as the ability to wake up the phone by double tapping the display (similar to LG’s Knock On), swipe the screen to the right to wake up the phone in BlinkFeed, swipe left to open the home screen directly, and so on. Sense 6 also offers a few more customization options than Sense 5 and allows the user to change the color of the quick settings toggles and BlinkFeed. There are a lot of new features introduced on this year’s One and it feels like HTC made an effort to improve the previous model in pretty much every possible regard. The new M8 might look similar to the older model, but it’s definitely not the same smartphone. It has evolved on all fronts, including design, software and hardware. Whether or not you feel like an upgrade is worth it is up to you, but if you’re planning on buying a new smartphone, then you should definitely take the new One into consideration. What’s your opinion on the new One? 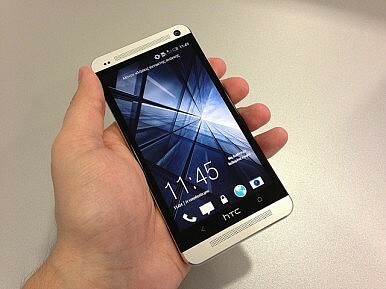 Do you think HTC did a good enough job to differentiate the new model from the previous flagship? The comment section is at your disposal. HTC One M8 Versus HTC One Mini 2Green Shoots Sighted for Asia’s EconomiesAn Oil Discovery Before Systemic Reform in Pakistan Would Be a TragedyIn Myanmar, Jittery Investors Threaten Long-Term DevelopmentAsia’s Elections: Market Moving or More of the Same?